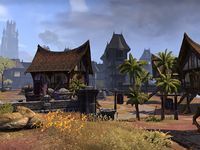 The city-state of Arenthia is situated in the region of Reaper's March, the borderlands between the provinces of Valenwood and Elsweyr, but it is also found near the border to Colovia, in the province of Cyrodiil. Arenthia's architecture and culture emphasize this cultural triumvirate. Arenthia's general area is known as the Northern Woods, which was at one point, called the South Weald. It was built on a fork where the Strid River continues into Cyrodiil, and it diverges down south to create the Crescent River, which makes up a large portion of the northern provincial border. Arenthia has two gates, the southern one leads into the rest of Reaper's March and Valenwood, while the northern bridge crosses the river, and enters the West Weald. The Strid River is surrounded by large hills and mounds. The outskirts consist of Ayleid ruins such as Senalana, and Colovian Forts, such as the town of Greenhill, and the well-known Moon Hunter Keep. Following the Crescent River will lead into the Falinesti Autumn Site, and the trading town of Rawl'kha. Rawl'kha's roads eventually led to Elsweyr and the city-state of Dune. Arenthia is neighbored by several settlements, including Thormar Keep. Arenthia is somewhat of a walled-off settlement, but the only defense comes from the natural mountains that cradle the city, and the Strid River's canyon. Arenthia is split into four districts. Outer Arenthia is surrounded by a traditional Imperial square, and various merchant stalls are set throughout the branching roads. Northwest of the square leads into the Strid bridge, while the southwest goes into Reaper's March. North of it is a small harbor, where many ships dock from the Strid River. Local guilds are found in west Arenthia. The Tower District is found in southern Arenthia, and it somewhat serves as a residential district. It is four buildings and a large tower that overlooks the city. The Temple District in the southeast contains a Temple to the Divines. It was abandoned following the Colovian's retreat from Reaper's March. It is said that Skooma Smugglers use the old Temple as their base of operations. Finally, there is the Residential District, found in east Arenthia. It contains several private homes and the Pious-Arenthi Inn, a rather large Imperial-style Inn that sits atop a mound that looks over the area. The city was founded during the Merethic Era and was named after the first king of the Bosmer, prior to the ascension of the Camoran Dynasty. By the end of the Merethic Era, King Eplear, a Bosmer warlord, united the tribes of Valenwood under his rule, an event traditionally regarded as the beginning of Year Zero of the First Era. This was the first time Arenthia passed to belong to a major realm. Darloc Brae, known as The Beast of Anequina, led the Anequine Conquests in the Fifth Century of the First Era, when the Cat-Folk soldiers of the Golden Beast ruled the land from the Larsius River to the Strid, seizing the Bosmer city of Arenthia from Valenwood and adding it to his numerous military victories. In 1E 2714, the city, along with the rest of Valenwood was conquered by the Second Empire, after centuries of unrelenting warfare along the border with Cyrodiil and a plague from Thras. Although the province became occupied by the Imperial Legion, they continued to experienced resistance from some natives for several years. In 2E 580, Arenthia was incorporated to the First Aldmeri Dominion along with the rest of Camoran-controlled Valenwood after Blacksap Rebellion was put down by Ayrenn and Aeradan Camoran joined forces. In 2E 582, the city was invaded by Colovians under General Lavina, leader of the Legion of the West Weald, and annexed to the Empire of Cyrodiil, only to encounter that the cathedral, the principal symbol of Imperial occupation, have been abandoned during the early years of the Interregnum. Although nominally part of Valenwood, the eminent Khajiit presence in Arenthia elevated a Khajiit woman to leader of the Resistance against Colovian occupation. After the eventual defeat of General Lavinia with the help of the Soulless One, a Clanmother began to rule the settlement in behalf of the Dominion, without discussing if the city should be part of Valenwood or Elsweyr. This situation remained until the eventual dissolution of the Dominion. After this, the majority, if not all, of the Imperials fled the city. 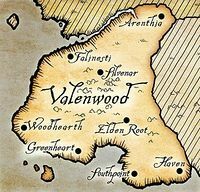 Since the beginning of the Third Era, Arenthia became part of the Province of Valenwood. Between 3E 249 and 3E 267, it was also reputedly the place where the Camoran Usurper first began his war of conquest, collecting a huge army of daedra and undead before first attacking Valenwood, then Hammerfell and High Rock. For the rest of the Third Era, Arenthia remained an integral part of the Third Empire. During the Imperial Simulacrum in the late Third Era, the city-state of Arenthia was an active settlement, being ruled by King Coman. It had a rivalry with Silvenar. The Oblivion Crisis that ended the Third Era and weakened the Empire provided the opportunity for the Thalmor to seized the Summerset Isles. In 4E 29, a Thalmor-backed coup overthrew Valenwood's government, routing Imperial forces and their Bosmer supporters. Alinor and Valenwood then proclaimed a union, and a new Aldmeri Dominion was formed. The city fell into Aldmeri hands for the third time in history. The city produces a vintage red wine known throughout Tamriel since, at least, the Second Era. Squeezes Boxes, hand-held musical reed instruments played by squeezing them in and out, were made in the city and popular with Colovian travelers by the mid-Second Era. This page was last modified on 17 January 2019, at 18:43.